Hashem has already laid the bedrock for the sustained future success of the game in Egypt. The Auskick clinics now being offered through the AUC (American University in Cairo) have already attracted solid numbers, with kids eager to take up the new sport. Unlike some developing leagues or clubs that grow from an ex-pat base of older players, the Egyptian venture is growing from the roots up. The logic being that if enough kids take up the sport then a ready-made base will exist to grow the game further. Without worrying about logistics initially, there is certainly the capacity for a burgeoning Egyptian football presence to play against some nearby Middle East teams as well as those in southern parts of Europe. 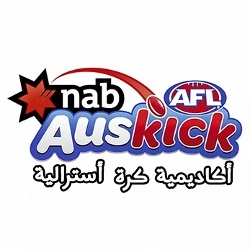 There is even a ready-made ambassador for the game in Egypt with former St Kilda player, Ahmed Saad, being the first Egyptian player in the AFL. Now running around for West Preston-Lakeside in Victoria’s Northern Football League, Saad might make the perfect spokesperson in Australia to promote the Egyptian game. ESPN reporter Callum Godde filed a story this week that featured an interview with Professor Hashem. The article details the journey so far for footy in Egypt, framed against the exploits of Australian soldiers playing the game in the shadows of the pyramids before their fateful journey to ANZAC Cove. Professor Hashem looks at the progress already made as well as the challenge ahead. There is much to be excited about in Egypt, and to give a fresh, novel perspective, that excitement is currently being driven by kids. However, if Professor Hashem has anything to do with it, that is about to change.